Bond had only been living in town for a year or so, but his brother, Pancho Romero Bond, was already established as the frontman of local “absurdist, gypsy, folk, funk, punk” band Sirius.B. Although not nearly the same level of showman as his brother, I’d argue that PJ Bond is clearly the better songwriter. 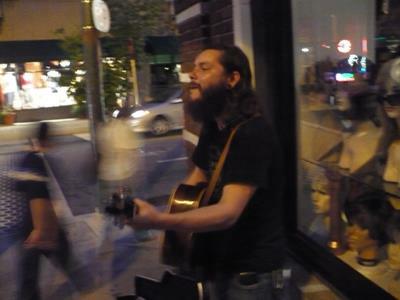 But PJ never really found his niche in novelty-act living Asheville, and his time as a busker didn’t last long. The summer of 2010 was one of the most fun eras of the Busk Break project thus far. It was the first year the city was truly inundated with street musicians, and the novelty had yet to wear of for most of the downtown set. Many of the buskers from that time weren’t local musicians looking for a place to play and earn a few bucks, rather than the turf-guarding professional buskers that now reign in the city. PJ Bond wasn’t one of those professional buskers. He playing for tips, but he didn’t need to. He was already a touring musician at this point, and had a studio album under his belt. There’s a lot to like in his work, and I highly suggest checking out his album You Didn’t Know I Was Alphabetical if you like what you hear in the video.